About product "Great White Shark Feminised"
Feminized seeds of Great White Shark are seductively beautiful. They consist for 100% of indica. Their plants are completely saturated with amazing fragrance of resin and seem to be powdered with a thick layer of snow-white crystals, that shows on belonging to the White strain family. Equal allocation of rich and solid buds all over the plant makes it even more attractive and perfectly symmetric. Magnificent taste and incredibly strong fragrance came to the strain from its notable “ancestors”. The strain was created by crossing few strains such as Brazilian, Super Skunk and South Indian. Feminized seeds of Great White Shark grow into plants which you may call with no hesitation real champions in the furious race of cannabis after taste, fragrance and produced effect. Due to its perfect taste and fragrance characteristics and also to its incredibly powerful effect Great White Shark became the winner of multiple different contests. Thus, it won the second place in 1997 in category Bio, and in 2005 the strain gained the first place at once at two contests such as HighLife in category Hydro and Super Cup HighLife. The fragrance that has Great White Shark strain may be characterized as floral with tone of fresh fruits. Skunk-fruit taste will be loved by lovers of classic cannabis, as it is completely deprived of any original supplements. But it is more its advantage than disadvantage, as it lets you fully to enjoy traditional fragrance of cannabis. Effect of the strain is worthy of the highest praises and is completely characteristic for representatives of indica, as it is powerful, assured with active cerebral action. In medicine they especially appreciate the high sedative effect of Great White Shark and also its amazing analgesic qualities. Due to its strong calming effect, the strain found its wide apply in psychiatry in treating affective states, insomnia and excessive anxiety. More details in the delivery section. Have you changed your mind and want to return the ordered seeds? No problem! You just have to return them during 30 days in the sealed original package, and you’ll recover 100% of your money. You must return the unopened package of seeds to us. Send your contact information and return address with the package. Please pay delivery by yourself. We do not accept collect on delivery shipments. Before sending the seeds, please consult with the manager of the online store. We will refund your money as soon as possible after receiving of seeds. Green Silk Road is more than ten years of hard and diligent work to select the best seeds of high quality and reliability, and earn an impeccable reputation among manufacturers. Our range is able to satisfy even the most demanding customers, including the world best varieties bred by professional breeders. An extensive database of equipment Green Silk Road offers perfect conditions for growing and storing cannabis seeds. 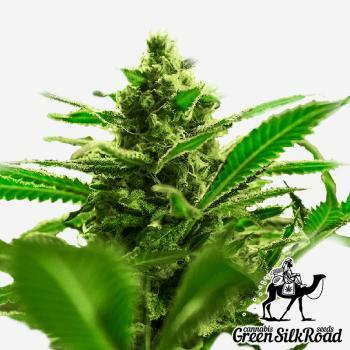 Green Silk Road - more than ten years of hard and diligent work to select the best seeds of highest quality and reliability and gain an impeccable reputation among manufacturers. Our range is able to satisfy the most demanding customers, and includes best world varieties bred by professional breeders. Green Silk Roads extensive equipment base provides perfect conditions for cultivation and storage of cannabis seeds. Our shop sells only feminized autoflowering seeds and photoperiodic varieties which have proven its maximum efficiency. Long-term partnerships with well-known breeding companies allow us to deliver the best seeds at competitive prices! Extensive collection of various Cannabis phenotypes gives our customers the widest choice from the latest innovations to beloved classics. The whole range of the store, no matter whether they are feminized or autoflowering photoperiodic seeds, is represented by first-generation hybrids (F1), which is a guarantee of quality and excellent germination. Here in Green Silk Road you can buy winners seeds of prestigious competitions and demonstrations, such as the High Times Cannabis Cup and the Highlife Cup. The new rising stars of marijuana are also represented in our store! Presenting customers the best cannabis seeds, Green Silk Road ensures a high-tech organic cultivation, strict quality standards and regular product monitoring, as well as exclusive hand-selected seeds.All products in our shop are offered exclusively in the form of souvenirs to those who have reached the age of 18. Our seeds are sold in full compliance with local legislation. Shop administrators recommend to refrain from any illegal actions, and shall not be responsible for the unlawful use of seeds.